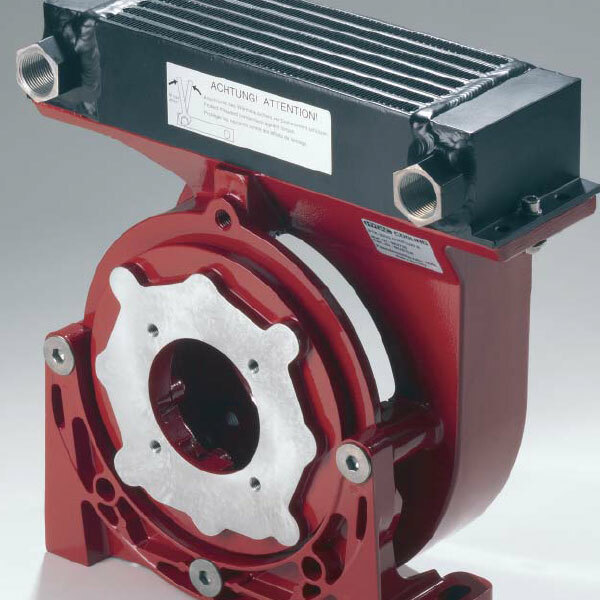 To begin with, the HYDAC bell housings serve as connection elements between drive motors and hydraulic pumps. We supply both connecting flanges ready for installation. The design of the bell housings is from an aluminium cast alloy. What’s more, the PTK (bell housing with built-in oil/air cooler) has a fan mounted on the motor shaft. Therefore, it produces an air stream, which cools the oil efficiently. Moreover, this combination of noise-damping bell housing and oil/air cooler considerably simplifies the construction. It also reduces the cost of hydraulic systems. On the other hand, the high cooling capacity of the built-in cooler enables the user to reduce his tank capacity. This reduction in oil quantity results in a reduction in operating costs and oil disposal costs.